Sika means figs in English, and I’m posting this photo of some sika growing nearby because our village, Sykia (or Sikia or Sikya) means fig tree. In the age of sail, seaside villages often took their names from some distinguishing feature of interest to mariners. Fresh water was always a concern, so there are villages called good water, lots of water, dry, etc. Navigation was an equal concern, and being able to locate one’s place on the map required landmarks, so other villages are named for whatever was most visible from the sea — the next village is called Xylokastro for its wooden castle or single castle. I doubt anyone out in the Gulf could spot a fig tree on the shore, so I assume our name promised that, at a minimum, figs could be had here. The village just east of us, Mellissi, would advertise the availability of honey. During the Ottoman occupation, the local Ottoman chieftan (bey) built a large house on the highest point of our village shore. The house included a tower, possibly a minaret, and so the village was renamed Pyrgos (tower). The tower was toppled when independence was won, and the name reverted to Sykia. I’ve learned that our village also has some ancient history, which isn’t too surprising in this part of Greece but all I know is that villagers digging in their gardens have found ancient artifacts. One of the most surprising things I’ve learned recently is that, into the Ottoman era, the sea extended right through the middle of the present village, almost back to Geliniatika, the village adjoining Sykia to the south. This revelation suddenly made sense of some landforms in the village that seemed odd but had not inspired any critical thought. It appears that sediments washing down from the hills above gradually silted in the anchorage, which would have included the site our apartment, and that the Old National Road, running along the beach, serves as a dike to keep the sea from reclaiming the land. I’ve just learned most of this detail about our part-time home from Sykia’s delightful and surprising website, Sykia.gr. Well designed, interesting, and useful, the site includes an excellent, full English translation and some very nice photography. 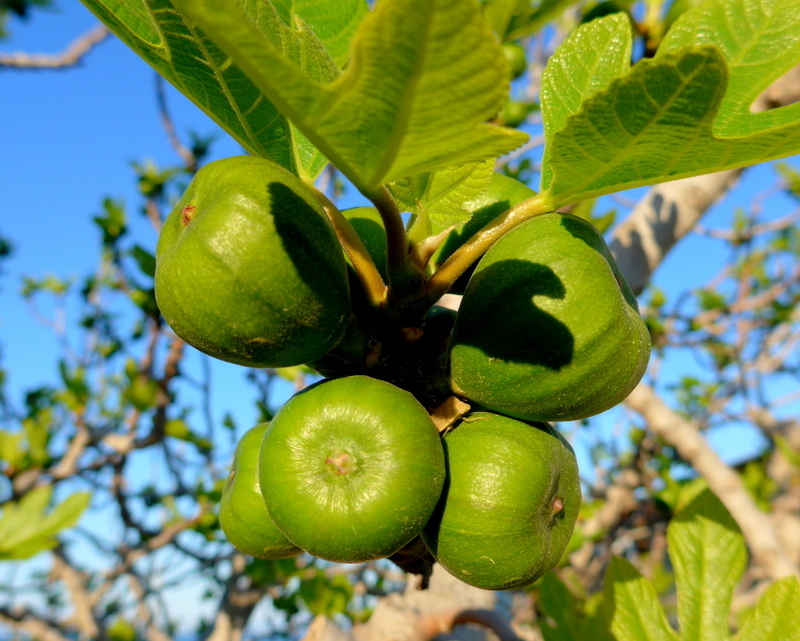 The website notes that, by legend, the fig tree for which the village was named stood on the hill by the bey’s house. There’s now a taverna at the foot of that hill called The Courtyard of the Bey, and I find myself walking the village trying to imagine the outline of the harbor, boats moored out in its center, travelers sitting at tables under the trees, and sailors carrying casks and crates down to a pier. It’s a new dimension of Sykia for me, and it comes thanks to the efforts of some of my approximately 600 neighbors to tell the story of this place. We’re beginning to feel as if we’re a part of this sweet village. Loved this brief intro into Sikia’s history. Looking forward to our stay at Daphne’s, although we will truly miss seeing the two of you!